• Sign up to host a Local Competition at PitchHitRun.com. Upon submitting an online registration with a date, time and location for your competition, you will receive a FREE administrative kit with materials necessary to host the competition. The kit includes a handbook, Strike Zone banner, registration forms, awards, participation cards, etc. • After completing your competition - Award participants, provide Sectional Competition information to your winners, submit results online and mail all completed registration forms. All-Around, Pitching, Hitting and Running Champions advance from EACH division age group. Each Sectional is part of an MLB team's geographic market. All-Around Champions in each division age group are ELIGIBLE to advance to their markets Team Championship. 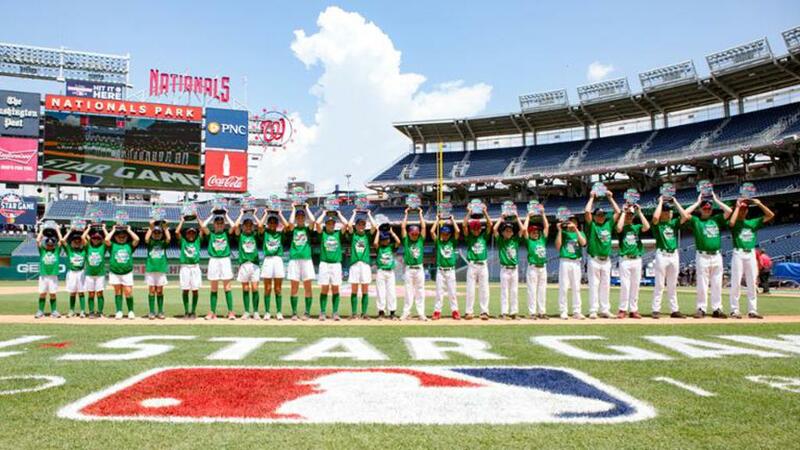 National Finalists will receive an all-expense paid trip to MLB All-Star Week. Finalists will participate in an array of festivities upon arrival, including competing on-field prior to shagging fly balls during the Home Run Derby! PRIZES/AWARDS: At each level of competition competitors will receive an item for their participation. Prizes at different levels of competition include certificates, medals, trophies and other awards. National Finalists receive a trip to MLB All-Star Week. * Competitors compete in four age groups: 7/8, 9/10, 11/12, 13/14. Age is determined as of July 17, 2019. Try to throw strikes like Major League pitchers by taking a shot at hitting the MLB Strike Zone. Each competitor receives six (6) attempts to hit the designated "Strike Zone". Competitors in the girls division compete from 35 feet away. Participants in the 7/8 and 9/10 girls division should compete with an 11-inch softball, whereas those in the 11/12 and 13/14 girls division should compete with a 12-inch softball. The competitor must start from the pitching rubber or chalk line and deliver each ball to the "Strike Zone" target. Treat the rubber/chalk line just as you would a pitching rubber in a real game. Each attempt hitting ANY portion of the "Strike Zone" target is worth 75 points. Swing away from home plate! Just like big leaguers, you'll be judged on distance and accuracy. Each competitor will be allowed three (3) swings in an attempt to hit the ball. Only the best of the three (3) attempts, as determined by the administrator, will count toward a competitor's score. A swing and a miss counts as one attempt (one swing = one attempt). A running or walking start is not permitted. Participant may take a single stride step, but cannot take multiple steps in attempt to hit the ball from a walking or running start. Start at second and head for home to test your speed at running the bases. The competitor will start at second base or the indicated start line. He/she will begin from a standing start, and begin running when the administrator yells GO! The runner will be timed from the moment he/she leaves second base, touches an anchored third base, and touches home plate. No sliding is allowed. Major League Baseball Pitch, Hit & Run is a national grassroots program that has four levels of competition -- Local, Sectional, Team Championship and National Finals. The first level is of a LOCAL scope. Everyone must participate in a local competition in order to advance to the higher levels. Champions at the local level advance to a SECTIONAL Competition. At this level, the Sectional All-Around Champions become eligible to advance to the TEAM CHAMPIONSHIPS, which are held during June in all 30 Major League Baseball markets. The culmination occurs at the NATIONAL FINALS, held at the 2019 All-Star Week. Each youngster MUST first participate at a local competition. The 1st Place All-Around, Pitching, Hitting and Running Champions in each age and gender group advance to the Sectional competition. At the Sectional competition, the youngster must be a 1st Place All-Around Champion in his/her age/gender group in order to become eligible to advance to the Team Championship. The Sectional All-Around Champions' scores are compared with the other Sectional Champions' scores in that respective MLB team market. The Top 3 participants in each age and gender group advance to the Team Championship. The Sectional Champion does NOT automatically advance to the Team Championship. After the Team Championships, the All-Around Champions in each age and gender group are ranked nationally by total score. The champions' scores from all 30 team markets are compared and the top scorers in each age and gender group nationwide advance to the National Finals. Each youngster may participate in only one local competition. Competing in more than one local will result in disqualification of that individual. Major League Baseball Pitch, Hit & Run endorses proper conduct and good sportsmanship. Major League Baseball, LEJ Sports Group and state coordinators and organizers of Major League Baseball Pitch, Hit & Run competition reserve the right to make rulings and recommendations regarding the competition events determined to be in the best interest of the program. All rulings and recommendations are final. Participation in the Major League Baseball Pitch, Hit & Run competition authorizes Major League Baseball and LEJ Sports Group to use participants name, likeness and other personal rights for promotional use without compensation. ©2019 Sierra Girls Softball League / SportsEngine. All Rights Reserved.